A professor of psychology, emeritus, at the University of Massachusetts Amherst, Dr. Ervin Staub is the founding director of the doctoral program on the psychology of peace and violence. His own experience as a Holocaust survivor has influenced his interest in studying the roots of caring, helping and active bystandnership, and the roots of violence between groups, especially mass killings, genocide, and terrorism. 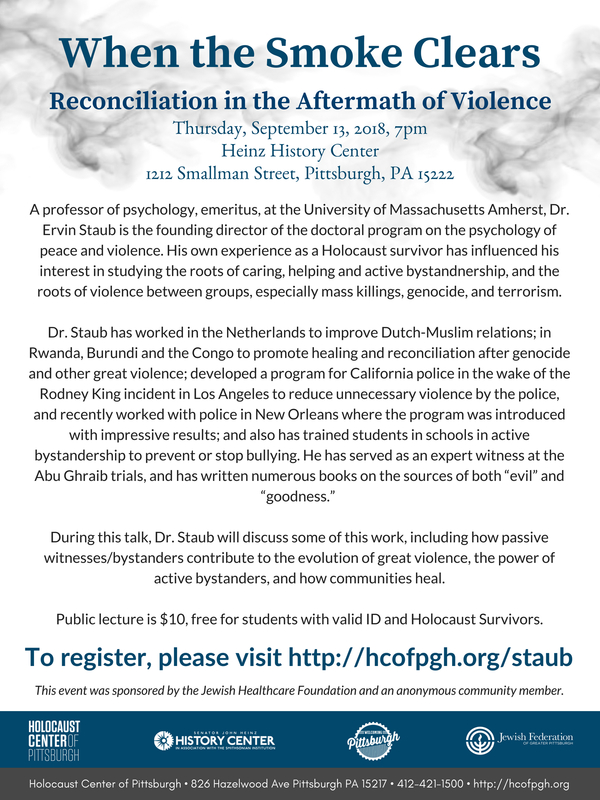 During this talk, Dr. Staub will discuss some of this work, including how passive witnesses/bystanders contribute to the evolution of great violence, the power of active bystanders, and how communities heal. Public lecture is $10, free for students with valid ID and Holocaust Survivors. This event was sponsored by the Jewish Healthcare Foundation and an anonymous community member.